An historical record from 1988 - 1992 of the spread of Varroa World Wide. Listing some of the early anti Varroa treatments tested. Varroa mites attack honey bee colonies as an external parasite of adult and developing bees, by feeding on hemolymph (fluid of the circulatory system similar to blood), spreading disease, and reducing their lifespan. Evidence suggests that Varroa and their vectored viruses affect the immune response of honey bees, making them more susceptible to disease agents. For more information on this topic see here. Mature female Varroa mites survive on immature and adult honey bees (worker, drone, and rarely queen), are reddish brown, and about the size of a pin head. Male mites are a smaller size and tan color, do not feed on bees, and are only found inside brood cells. Varroa have two life stages, phoretic and reproductive. The phoretic stage is when a mature Varroa mite is attached to an adult bee and survives on the bee’s hemolymph. During this stage the mite may change hosts often transmitting viruses by picking up the virus on one individual and injecting it to another during feeding. Phoretic mites may fall off the host, sometimes being bitten when bees groom each other, or it may die of old age. Mites found on the bottom board of the hive or that fall though a screen bottom board are called the “natural mite drop”. But these mites that fall off of bees represent a small portion of the total mite population because the reproductive mites are hidden under cell cappings. A "mother" mite may lay an egg every 36 hours on the side of a cell. The first egg usually hatches into a male and stays within the cell. The other eggs hatch into females and feed and grow within the cell. Next, they mate with the male and emerge from the cell when the bee emerges. The mother mite will seek out another cell while her daughter mites may hitch a ride on an adult bee and feed for awhile before finding a new larval host. Mite populations increase slowly when starting from just a few mites, but the hitchhiking behaviour of the mite can spread large numbers of mites with drifting or robbing bees causing a hive to quickly become heavily infested. When a larvae is infested by two or three mites, it will usually die. As a colony reaches a point of collapse, bees sometimes abandon the hive and carry mites to neighbouring hives. This is called "Re-infestation" and can cause a beekeeper who has looked after his hive and reduced varroa to less than 5%, to find his hive now infested back to 95% and on the point of collapse. 1. Extract drone brood with a de-capping fork and visually examine larvae and cells for mites. 2. A reliable method uses Apistan/Bayvarol strips. Place a piece of stiff white paper sprayed with aerosol cooking oil/something sticky, on the hive floor. Insert strips of Apistan according to label directions. Check the paper in one hour. If there are no mites, check again the next day. 1. Regularly monitor the infestation level in your colonies. This will warn you if the mite population is building up to a damaging level faster than expected, or if your control methods are not proving effective. Don't just treat and leave it to chance. 2. Don't assume that a single chemical treatment or a single biotechnical method will always provide sufficient control. Practise integrated control of varroa, using a combination of methods each working in different ways and at different times of the year. This will give you the most effective control. 3. 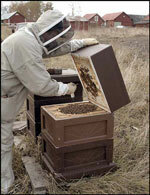 Try to co-ordinate treatment programmes with other beekeepers in the area, to reduce mite re-invasion problems. Your local beekeepers' association will be able to help organise this. 4. Never leave infested colonies unmanaged. They will eventually be killed by varroa and in the meantime they will re-infest the colonies of other local beekeepers who are trying to control infestation. If you can't manage your bees, you should consider selling or giving them to others who can. Control measures are advised if any mites are detected in any hive in an apiary and hence on all hives within that apiary. However it is impossible to apply treatments with substances suspected of leaving residues in honey during the honey flow period which is between April and the end of August. Below is a table of natural mite drop. If your hive is approaching tolerance level or in danger of collapse, remove what honey you might have and treat. The 'Central Science Laboratory' or CSL have set up a 'beebase' on their web pages for anyone to check their varroa mite drop over a period of time and gives recommendations for treatment dependant on your mite drop. This video shows the juxtaposition of the life cycles of the honey bee and the varroa mite. It was created by Jeff Harris of the Agriculture Research Service. What to treat with ? Strips impregnated with chemicals ... (Apistan - Taufluvalinate/pyrethroids and Apivar - Amitraz), and are placed within the hive. Manufacturer's instructions on the packet should be followed precisely. Leaving the strips in longer than recommended will lead to resistant mites developing. These chemical residues are not permitted in honey. Chemical residues due to Apistan/Apivarl treatments, present on wax surfaces, continue their action even after the end of treatment. Thus, they prevent normal development of the varroa population. This is the reason why it has been observed in the majority of apiaries treated with pyrethroids in the past that the mite fall is 2 to 3 times smaller than in apiaries treated with alternative methods. Many beekeepers in the UK are now reporting that they have resistant mites, making Apistan totally ineffective. Apivar is not licensed in the UK as such ... however it is used on mainland Europe and under present legislation, a veterinary can issue a prescription for individual use by beekeepers. There are various formic acid dispensers that are commercially available ... Apidea - Nassenheider - Liebefelder - Universal evapourator - Krämerboard. The use of the Krämerboard is one of the most popular methods and is used by 60% of the beekeepers in Denmark. The Krämerboard involves putting 60ml of 60% formic acid on a 20 x 24 x 1.5cm piece of soft fibre building board or absorbent flat 'kitchen' sponge, then sealing it in a plastic freezer bag. Day 1 ... Place the flat sponge on the wooden strips, carefully squirt 20mls 60% acid onto it. Day 4 ... Carefully squirt another 20mls, 60% acid onto the sponge. Day 7 ... Carefully squirt another 20mls, 60% acid onto the sponge. Buying Formic acid at 85% solution and wanting to dilute to 60% ? Diluting a volume of a solution does not change the amount of the solute. It is normal to apply formic acid in July, August and September. The first application should take place after honey harvest (give them some sugar first), the second application directly after wintering is completed. Research shows that formic acid can also be used in spring, for example in combination with swarm prevention. Formic acid has a knockdown success rate of 85% to 98%. At low evapouration rates the efficacy is lower. Use a floor insert a few weeks after the treatment and check effectiveness. Formic acid damages the brood and causes some bee mortality, but both effects are negligible. Drones however are hindered by formic acid. Do not use formic acid in colonies purposely used for drone production. A further drawback is the use of a high 85% acid concentration causes loss of queen bees. Formic acid is a corrosive chemical that is potentially hazardous to humans unless proper precautions are taken and needs to be handled very carefully with full protective clothing. Avoid skin and eye contact as well as inhaling vapour. Always wear protective gloves and safety goggles. When using formic acid use a gas mask. Dust masks are not sufficient. The acid also damages clothes. Oxalic acid dissolves to some extent in water, but has a notable fondness for glycerin. This makes food-grade glycerin an attractive carrier for oxalic acid in the hive, especially since its oily nature also confers upon it an affinity for bee (and mite) cuticle. 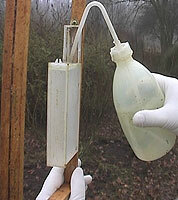 Practical application: by dissolving oxalic acid into glycerin, and then saturating a cardboard strip with the solution, one can obtain an extended release application method for the acid into the hive, thus continually killing mites over more than one reproductive cycle, thereby overcoming the limitation of the dribble or vaporization application methods. Click here to download .pdf file of the full details. This method requires a relatively small amount of labour using a syringe. 35g of oxalic acid and 200g sugar are dissolved in 3/4 litre of water, then add more water to make up to ONE LITRE of solution. 5ml of this solution are trickled into a bee-way of bee occupied comb. 50ml of this solution is required for a strong colony with only 30ml for a weak one. This method should only be carried out once every year to avoid increased acidity levels in the bees. Treatment efficacy in broodless colonies is in general more than 95% and is very well tolerated by the bees. It has no effect on varroa mites within the brood cells. The natural oxalic acid content of honey is not altered by a single treatment with oxalic acid. In beeswax there is no notable risk of residues, because the acids are not fat soluble. For this method a solution of 30g of oxalic acid are dissolved in one litre of water. 3 to 4 ml of the solution are sprayed to each side of the brood frame. This treatment is well tolerated by the bees but is very time consuming. This equipment consists of a small dish approximately 25mm x 10mm and has two electrical cables attached to it. The small dish is inserted 4 cm into a sealed hive entrance and contains 2g of oxalic acid. The electrical cables are connected to a 12v battery, the dish heats up and acid vaporises, with the same effect as the vaporisers mentioned below. Caution - there have been reported incidences of hives being set on fire using this method - Brace comb hanging down under the brood frames comes into direct contact with the heater which melts the wax and causes it to ignite. ! This is a home made equipment and consists of two pieces of bent copper pipe with a block of wood connecting the two pipes. The open ended pipe is inserted into either the sealed entrance or the feed hole in the crown board. 3g of oxalic acid are feed into the sealed section of the pipe and shaken to the bottom. Both pipes are now connected via the block of wood and the sealed end is heated with a blow torch and the oxalic acid vaporises, passing up into the hive. Convert a spare roof and fit a glass window in it. A copper tube fits into the side of the roof and protrudes across the roof's width, having it's underside peeled open to allow the oxalic vapour to escape. Remove the hive roof and crown board. Place the vaporiser roof over the hive. The open end of the copper tube, outside the roof, has a blanking cap fitted and is filled with 3 grams oxalic acid. This cap is heated with a blow torch and you can observe the oxalic vapour entering the hive. The vapour condenses within a few minutes in the hive on the bees, honeycomb and stores. Each time the bees move over the condensed material they carry very small quantities of the crystals on their feet. The humidity in the hive makes the oxalic acid active and it corrodes the varroa mite proboscis. The mites die of starvation after about three days. Treat when the bees are not flying. "Effect on bees: oxalic acid applied by sublimation did not decrease bee lifespan over the 21 days of observation contrary to trickling, where a nonsignificant lifespan decrease was observed. Topical (trickling) application of oxalic acid increased the rate of midgut cell apoptosis, with a stronger statistically significant effect seen in the group treated by trickling. " Oxalic acid is very powerful oxidant and will cause serious injury if handled incorrectly. It must be treated with respect. Wear proper protective clothing and in particular, if vapourising a suitable face mask. This is a 'new' type of floor board which consists of a wooden frame with a removable centre made of polythene tubes, 3.5mm apart, held together by three struts. It has kept an apiary in Parisian region healthy without any treatment against Varroa mites since the 28th April 1997.
optimal elimination of hive waste due to the gap between tubes. bottom board does not require cleaning at the end of winter. moderate opening uniformity spaced is easily managed by the bees to provide the colony the best atmosphere which makes it healthier and stronger in spring. thermal insulation to protect the bottom of the hive in winter. food quality polythene tubes are anti adhesive and reinforces the self cleaning properties of the board. Product name of 'Apiguard' and 'Api-Life VAR' comes in a shallow tray. Peel off the top and place on the top of the brood frame. Recommended min. outside air temperature of 15ºC for usage. Make sure the workers can access the portion. In some hives, a passage has to be organised over the portion, for example, by using an upside down hive cover or feeder or an empty super. Leave the portions in the hive until all the gel disappears. Check for changes in the colony: sometimes another off-season treatment is needed. After starting the treatment, the colony is sometimes seized by a temporary, but harmless, agitation. Generally, the application of thymol products leaves relatively important residues in beeswax (500-600 mg thymol per kg beeswax). However, it does not accumulate from one treatment to the next and it evapourates rapidly depending on the temperature. Varroa have a preference for drone brood. By inserting drone foundation and removing sealed drone brood, populations may be kept in check. During the summer months varroa spend most of their life cycle within the brood cells. By exercising control over where the queen is laying, it is possible over a period to trap large numbers of varroa within the brood cells. These can be removed for destruction or treatment to destroy the varroa mites. Dust or powders such as ground pollen, glucose, chalk flour and icing sugars can be used for this purpose. 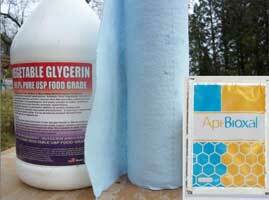 Approximately 50ml applied over the bees on top bars repeated every four days for six applications. mites are not killed and have to be trapped as they fall off and onto the floor. Exploits the natural death rate of varroa mite by re-queening through de-queening. May include further caging. Summer mites are said to survive from between 1.5 - 3 months.